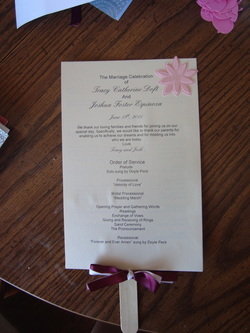 These are the homemade wedding programs. We used some pearly champagne cardstock. Large craft sticks, ribbon, cement glue and a martha stewart punch. I wish I could share with you the template I made. Sadly, that computer crashed and is no longer in working condition. I honestly just searched the internet for some programs and edited them to my liking. I also downloaded a font I liked from www.dafont.com. 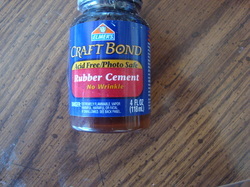 Using rubber cement we glued the two sides together, also gluing the large craft stick at the same time. We cut out flowers on pearly pink cardstock using this Martha Stewart Punch, and rubber cemented the flowers to the top right corners of the programs.